It's always sad to see favorite sets go, and this was a favorite of mine. I hope you enjoy the projects I made with it. To see the Last Chance lists, simply click on the button to the right and download the files. I am very sad to see this set go. It only appeared in one catalog and has been on the dormant list since January. I feel like this set didn't get a fair chance. It's such a great set for masculine cards and travel scrapbooks. I decided to put it to the test and do something a little on the feminine side with it as well. I hope you enjoy my projects. My next card reminds me of a trip my family and I took on a steam train up in east Texas. It was fall at the time and there was a little color in the area. All products from Stampin' Up! I used the poppin' pastels technique on this card and sponged the pastels over the Versamark to give it that fallish look. I used the circle brads because they kind of reminded me of train wheels. For my last project, I wanted to create a mini album that represented my journey with my husband of 22 years. We have so many great memories of our years and it truly has been a journey. At first I was going to create something more neutral based but then I decided that this was for me and I wanted it to be a little more feminine. Here's what I came up with. 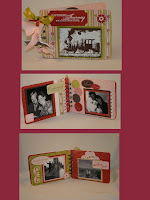 This is a little mini album made with rectangular coasters. I used the Sweet Nothings Simply Scrappin' Kit for this project and matching ribbons. I really have to say that I'm pleased with the way it came out. The pictures inside represent many phases of our lives from our honeymoon to a trip we took last fall to celebrate our birthdays. This is a little scrapbook that I know I'll keep forever. Remember you can only get the sets on the last chance list until June 30th! Your mini album is so soft and beautiful, Sharon. I never would've expected that from this set! Bravo! The coaster album is SO COOL!!!! What a neat and unexpected color scheme, too. Sharon, I LOVE the album. The cards are amazing also. I really appreciate the way you showcased this set. Awesome projects Sharon. I ♥ the black and white card and the mini album! Good for you for making it in the colors you wanted. I LOVE how your mini album combines masculine and feminine elements making it so perfect for an album about you and DH! The sentimental journey project is extra special! Sharon, they are just wonderful. Gorgeous projects Sharon. You've shown us several facets of one of my favorite sets. I especially love the sweet and feminine mini book. I've always known this set had a lot to offer! Fabulous stuff Sharon. I love that mini album you made. I would never of thought of that for this set but it works so well. It's so great to see all the creativity here. Love the mini album. What fabulous projects! They are all great. I love the fall color card! Wow, I LOVE the first card! This is not a set that I would choose for myself, but you've done an amazing job with it. Love the mini album. It's beautiful! Love the cards, love the album!!! Thanks for sharing your beautiful projects. That little album is so cool! Your second card using the popping pastels techniques is absolutley stunning!! As always, I admire your mini album but all of these projects are so cute!!! What a great stop on the hop, Sharon! Loved your poppin' pastels, but the real eyecatcher for me was your first card. It looks like a vintage tintype photograph, which is perfect for this set! Love all your projects Sharon! I love the album, very pretty! Your projects are all fantastic . . . and I LOVE how your poppin' pastel card turned out! WOW! Sharon, you've done a fabulous job of showcasing this set! All of your projects are beautiful, and the coaster album is awesome! Great Projects! You really showed that you can use this set for many occasions. Sharon, I love the album, what a great keepsake for years to come! Great job with your projects! 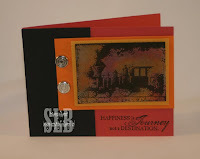 Love your projects with this stamp set Sharon! Thanks for sharing. Sharon-your projects are just amazing! I am so bad about checking the dormant list, I am kicking myself for not getting this set. I really like your mini album-beautiful colors, layout, everything! My hubby and I started dating in '85, so we have had quite a journey too-thanks for reminding me to take a trip down memory lane. Very nice projects. Thank you for all of this. It is so much fun. oh wow, Sharon, these are all fabulous projects! I love what you've done with this stamp set! !